This blog will demonstrate some bad habits in LinqToSql and how to deal with nullable types that provide clean code without null checks all over and improved performance on the projections. Excellent, then add a reference to the HibernatingRhinos.Profiler.Appender.dll which I guess can be in your lib folder. Right, now lets have a look at some customer code that is causing 2 hits to the database, which we can reduce it to one hit. So from above, if we attach the L2SQL profiler, we will see 2 exact same queries going to the DB, one for the .Any() and then the other for the c.First. 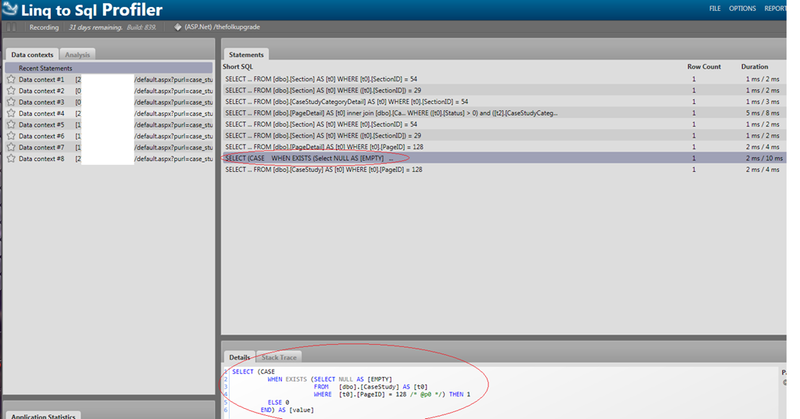 Now in the profiler, we will see only 1 statement being executed, as we removed the Any() extension method. This is much less columns being returned. However, we can improve this further by creating a method to handle this for us, how about something along the lines of NullableFirstOrDefault…. Now, we get the same result, with limited projection over the wire, but we can then use this as an extension method to optimise all nullable first or defaults. Nice, now look how easy the code is to read and it is optimised on projects. This anti pattern was used allot throughout their code, and caused double/triple calls to the DB for every page load. Therefore, using a profiling tool like NHProf, L2SProf or EHProf will save you and your customer/employee allot of money in the long term and perhaps save developers from picking up bad habits where IQuerable is being abused and treated like lists when in fact they execute on the backend. We have solved this, and also provided a neat way of dealing with nullable types with clean extension methods. So we have solved scalar issues with FirstOrDefault and the code below which is easy to write to the untrained eye will not need to be thought of when invalid checks occur on nullable types by using the custom extension methods provided above. 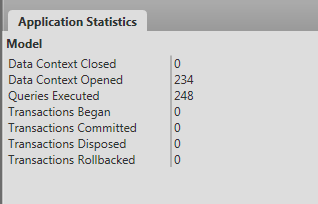 Above, we have +- 700 SQL Statements being called, and each on average uses a data context. Try to have a minimum amount of data contexts. One Data Context can server all sorts of requests, so when choosing a repository pattern or strategy profile the number of data contexts created and try reduce them. This Matthew Wills guy sounds fantastic!